Not all of my figures have fallen to pieces. The hand-crafted leader of Cobra managed to avoid the fate of many of my other G.I. Joe figures and has kept himself in one piece over the last 30 years. 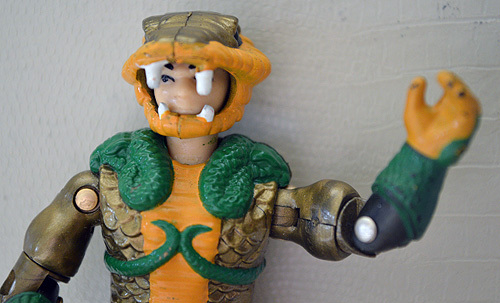 The egotistical Serpentor was never a character I particularly cared for. He always had a bloated sense of self importance. Sure, Cobra Commander had the same failing, but there was something comical about it. 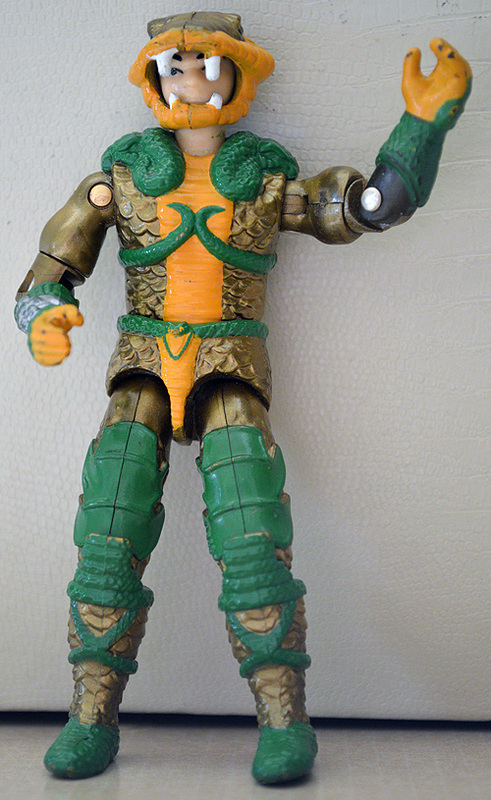 Serpentor, on the other hand, took himself too seriously. Like a spoiled child whose folks told him he was special until he believed it religiously. Serpentor is one of the few left standing. But gotta give this figure credit, he’s kept himself in shape. The joints aren’t very loose, his band has remained strong. The paint has worn in places, but that’s to be expected, he did get played with a bit back in my younger years. Cannot say the same for his varied accessories. They have all vanished with time, I’m afraid. Never bothered with Serpentor as a kid. Cobra Commander and Destro were where it was at! You blog is awesome. Keep those Joes coming!